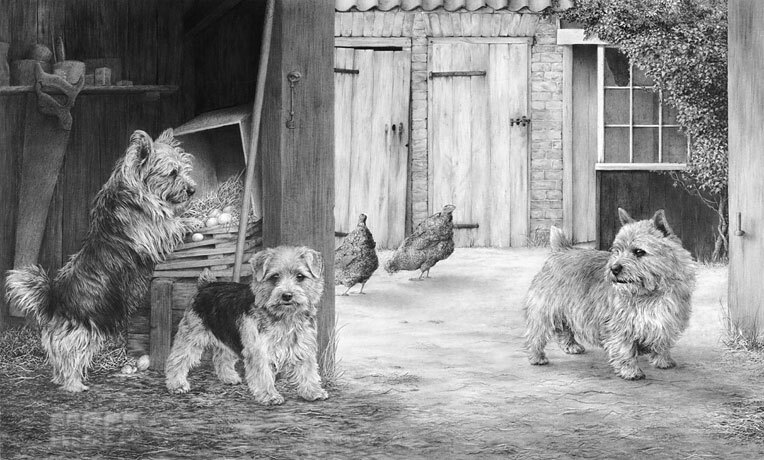 "Rags, Tatters & Gentleman George"
I had one clear idea with this drawing - to include at least one pet dog alongside a well-groomed show specimen. Tatters, the pup, arrived at a later stage and I couldn't resist including him. The setting is imaginary but has a basis in our own barn - certainly, the two Maran hens are ours. As is the saw (included to indicate scale) which belonged to my late Grandfather, a professional carpenter. The original drawing took 183 hours to complete and is now in a private American collection. image : 18½" × 11½"